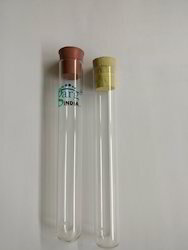 Being a well-distinguished company in the market, we are into offering Laboratory Test Tube. In our very large line of products we are offer an array of Glass Test Tubes. We procure borosilicate 3.3 glass having strong heat resistance to manufacture this range of consignments. Customers can avail this array of test tubes in plain or graduated featured with a stopper. The diameters of the tubes is from 10 mm to 38 mm. We offer deflection tube and many other cathode ray tubes. Deflection tube to show deflection by magnet. Test Tubes Neutral Hard Glass, Heat resistant, Autoclavable, Resistant to Temperature upto 350°C, without Rim. With the help of adroit team, we present an extensive series of Chemicals Glass Tubes. Our products are available in varied specifications that meet on consumer’s demand. Riding on unfathomable volumes of industrial expertise, we are manufacturing, exporting and supplying an excellent range of Glass Test Tube.